One of my favorite “go-to” meals for an easy lunch or quick dinner is Chicken Salad. My husband will even eat a chicken salad sandwich for breakfast sometimes. When I know we’re going to have a busy week, I make sure I have a bowl of Chicken Salad in my refrigerator. Then I don’t have to worry about what we’re having for lunch or even dinner some days. One of the reasons I love Chicken Salad is that it is such a versatile meal. Awhile back I posted “Six Ways to Serve Chicken Salad“. So we don’t really get bored with it either! This Winter as we have had one frigid day after another, many days not even reaching zero degrees, I have enjoyed having my Chicken Salad warm. Toasted Chicken Salad has been a regular meal in our home! I love serving it with fresh fruit and veggies and a side of sweet potato fries. Mix chicken, celery, apple, and mayo in a bowl. Salt and pepper to taste. Lightly spread mayonnaise on one side of each slice of bread. The mayo helps give the bread a nice golden color when toasting. On the opposite side of four slices of bread sprinkle a light layer of cheese, spread some chicken salad, top with a slice of tomato, sprinkle another light layer of cheese and top with a slice of bread. Repeat. Place sandwiches onto an electric skillet or a cast iron skillet. Toast sandwiches over medium-low heat until outside of bread is lightly browned and cheese is melted. Serve warm. Note: You’ll most likely have enough chicken salad to make more than 6 sandwiches. I make what I need for dinner and then we have leftover chicken salad for sandwiches for a couple days. At some point I loose track how many sandwiches I actually make! I link up to these Blog Parties! 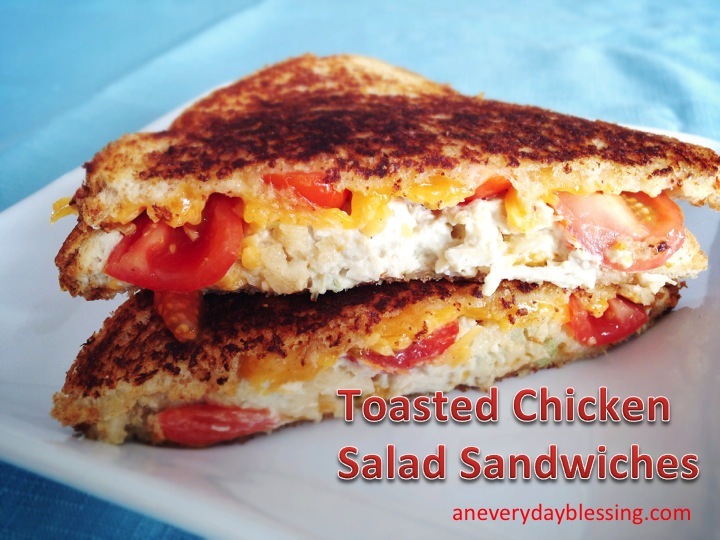 This entry was posted in Recipes and tagged chicken melt, chicken salad, dinner idea. Bookmark the permalink. This looks great! What a nice twist. Looks and sounds delicious!! Gotta try it! I’m all for fast and easy dinner ideas! Yum yum, this sounds tasty indeed 🙂 Gonna pin it for when I got leftover roasted chicken! Coming from Frugal Crafty Home Blog Hop. Visit my blog and say Hi! Yum…would be great with a homemade soup! Thanks for sharing on the Thursday Blog Hop! It look so good to me. A big chunk of chicken in between the bread… my cups of tea. Thanks for sharing with 4 seasons blog hop. have a nice day. That looks like my kind of sandwich, I would love your Toasted Chicken Salad Sandwich. Thank you so much for sharing this awesome recipe with Full Plate Thursday. Hope you are having a great weekend and come back soon! This is a fun twist! We so commonly eat chicken salad on croissants. Hubby loves toasted sandwiches! Thanks for sharing with SYC. Thanks Jann. Love chicken salad on croissants too! Wanted to thank you again for sharing on the Four Seasons Blog Hop! We loved your Toasted Chicken Salad Sandwich so much that it will be featured on this week’s party! Thanks for sharing on Tutorial Thursdays Linky Party this month. I look forward to seeing you again in the next month’s linky.